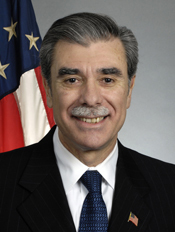 Carlos M. Gutierrez is the 35th Secretary of the U.S. Department of Commerce, the voice of business in government. The former chairman of the board and chief executive officer of Kellogg Company, Secretary Gutierrez is a core member of President Bush’s economic team. In nominating Mr. Gutierrez, President Bush said, "He understands the world of business, from the first rung on the ladder to the very top. He knows exactly what it takes to help American businesses grow and to create jobs." A top priority for Secretary Gutierrez is prying open global markets for U.S. companies so they can continue innovating and competing to build a stronger American economy. The Secretary regularly travels internationally to visit with foreign government and business leaders to discuss ways to enhance trade and promote U.S. exports. He played a key role in the passage of CAFTA-DR, a landmark agreement that strips away trade barriers, expands export opportunities and boosts hope and opportunity throughout Latin America. He believes passionately in President Bush’s vision of a 21st century where America is the best country in the world to do business and where everyone has the opportunity to experience the joy and pride of living the American Dream. "We have the best people, we have the training, we have the culture," Gutierrez says. "I believe the 21st century is really and truly the American century." Secretary Gutierrez oversees a diverse Cabinet agency with some 38,000 workers and a $6.8 billion budget focused on promoting American business at home and abroad. His Department gathers vast quantities of economic and demographic data to measure the health and vitality of the economy, promotes U.S. exports, enforces international trade agreements and regulates the export of sensitive goods and technologies. Commerce also issues patents and trademarks, protects intellectual property, forecasts the weather, conducts oceanic and atmospheric research, provides stewardship over living marine resources, develops and applies technology, measurements and standards, formulates telecommunications and technology policy, fosters minority business development and promotes economic growth in distressed communities. As co-chair for the Commission for Assistance to a Free Cuba, Secretary Gutierrez is actively involved in U.S. - Cuba policy. He is a strong advocate for the Bush Administration’s policy of helping the Cuban people hasten the day of their freedom from dictatorship. Secretary Gutierrez is also one of the President’s point men on comprehensive immigration reform, an issue he sees as one of the greatest domestic social issues of our time. He believes a successful immigration solution must focus first on securing our borders, but must also address immigrants contribution to our economy and the importance of American unity. Secretary Gutierrez was sworn into office on February 7, 2005. Born in Havana, Cuba in 1953, he came to the United States with his family in 1960. In 1975 he joined Kellogg as a sales representative. Rising to president and chief executive officer in 1999, he was the youngest CEO in the company’s nearly 100-year history. In April 2000, he was named chairman of the board of Kellogg Company. Secretary Gutierrez studied business administration at the Monterrey Institute of Technology in Queretaro, Mexico. He and his wife, Edilia, have three children, Carlos, Erika and Karina.